An easy-to-use liquid graffiti remover, with deep penetrating action designed for use on brick, masonry,concrete, stone and painted masonry and stone surfaces. This unique product formulation reliquefies and dissolves spray paint and marker tracks within seconds. 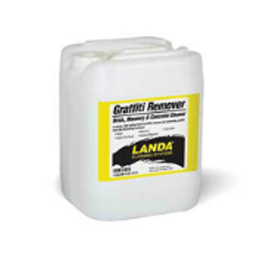 No extended soak time is needed and Landa Graffiti Remover – Brick, Masonry & Concrete Cleaner can be reapplied to wet surfaces as needed, without waiting for drying first. mix ratio: Apply undiluted directly to surface. A strong and fast-acting, biodegradable, liquid graffiti remover designed for use on pre-finished metal and powder-coated surfaces such as overhead doors, color bonded fencing, mail boxes, traffic signal boxes, painted metal and other metal surfaces. This strong and fast-acting product formulation safely penetrates and loosens the graffiti on metal surfaces and makes it easy to remove. No extended soak time is needed and Landa Graffiti Remover – Metal Saver can be reapplied to wet surfaces as needed, without waiting for drying first. mix ratio: Apply undiluted directly to surface. A fast-acting biodegradable, liquid graffiti remover designed for use on interior and exterior signs such as traffic signs, interstate highway signs, rail signs, metal signs, some plastic signs and any metal sign with a reflective coating. This strong and fast-acting product formulation safely penetrates and loosens the graffiti on sign surfaces and makes it easy to remove. 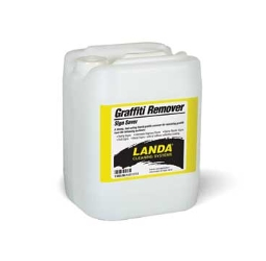 No extended soak time is needed and Landa Graffiti Remover – Sign Saver can be reapplied to wet surfaces as needed, without waiting for drying first. mix ratio: Apply undiluted directly to surface.